Q From Cordoba, Carlos Flores Garcia asks Could you tell me some details about the Championship Play-off match played on 21st May 1891, at Cathkin Park between Dumbarton and Glasgow Rangers? Could tell me line-ups, the scorers, time of goals, size of crowd, and who was the referee?" The referee was Mr J Marshall of the Third Lanark club. Goal times weren't recorded too precisely in those days. David Hislop scored for Rangers in the first minute. Hugh McCreadie also scored for Rangers in the first half. Either John Bell or John Taylor scored for Dumbarton just after an hour's play (there are conflicting reports but Dumbarton's official history says it was Taylor) and John Miller equalised. The teams discussed whether or not to play thirty minutes extra time but decided not to. Later, the Scottish League decided not to order another match and awarded the title to be shared by both sides. Q Carlos is also looking for information on the fine Hamilton Accies side of the mid-1930s which reached the Scottish Cup Final in 1935. He writes: Who were the men who faced Rangers in that Final? Did they have any chance to win or were they easily beaten? Could you tell me who were the most important Hamilton players in those years, who won international caps, and if they stayed at Douglas Park or finally went south of the border to play in England? Among the Hamilton players in those years was an Englishman called Wilson. Did he win any cap for England? I think he played in an unofficial match for Scotland against the United States?" Morgan, Wallace, Bulloch, Cox, McStay, Murray, King, McLaren, Wilson, Harrison, Reid. 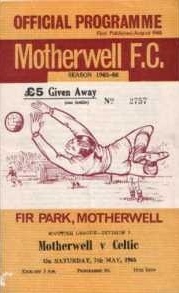 Morgan saved a Bob McPhail penalty at 0-0. Rangers were the better team in the first half and Jimmy Smith scored after 35 minutes. Hamilton equalised through Jimmy King four minutes into the second half and enjoyed their best spell of play during this period. Smith scored with a header following a corner kick after an hour and that was enough to win the Cup. It wasn't a particularly good game but I wouldn't say Hamilton had no chance to win as they had finished 4th in the league that season and 2-1 is a narrow loss. Hamilton have only ever had two players capped by Scotland. Outside-left Bobby Howe was the first in 1929, winning two caps, against The Netherlands and Norway. He was transferred to Hearts in 1932 and by 1935 was with Third Lanark. He played in their losing Scottish Cup Final team of 1936. He never played in England. Jimmy King, right-winger in the 1935 Final was equally at home on the left and he played against Northern Ireland in 1932-33 and 1933-34. Hamilton were his only senior club. The fans turned his name round from James King to King James! Of the rest of the Cup Final team I can only find two who played in England. Jackie Cox played briefly with Preston, Bobby Reid moved to Brentford after the Final and played over 100 times there (they were then a First Division side) then moved on to Sheffield United. At the end of the Second World War he joined Bury then came back to Scotland to end his career at Third Lanark. The first player to be capped for England while not with an English club was Joe Baker of Hibernian in November 1959 so David Wilson didn't play for England. You're right about him playing against the USA as part of the SFA touring side of 1935. He also played against Eastern Canada on the same tour and scored a hat-trick in a 6-0 win. Although the Americans regarded their games against Scotland as official the Scots did not. The strict rules in force at the time regarding eligibility and nationality would have made it impossible for Wilson to play officially for Scotland. Q From Spain on to Norway for the next question, from Preben Jacobsen. For which club did Steve Archibald make his league debut in Scotland? I know he played one match for East Stirling; do you have the date, league/cup/private etc. for this match? I am especially interested in the type of match he played. If it is not East Stirling: For which team did he make his league debut in Scotland?" A Hmm, this is not as clear-cut as it seems. There was an Archibald who played centre-forward for East Stirling v Brechin City on March 16th 1974 in a Second Division match won 3-1 by the visitors in front of around 500 fans. However the Scottish Football League has no record of Steve Archibald being registered with East Stirlingshire. Their earliest record is of him taking part in a reserve match for Clyde v Celtic a month later. Steve Archibald's first team debut for Clyde was away to Ayr United in the old First Division (Level One) on January 11th 1975 in a 0-0 draw watched by a crowd of 4,557. Unless or until someone can clear this up (any 'Shire anoraks out there?) the best that can be said is it's one of those two matches. Q On to Italy for the next query. Gabriele Tox, in Florence, asks: "In the 1880s it appears that a Robert Brown senior and Robert Brown junior played both for Dumbarton & Scotland. There was a Robert Brown of Dumbarton capped against Ireland in January 1884 and against Wales in March that year. Then in 1885 ANOTHER Robert Brown, also of Dumbarton, capped against Wales. Is this right? Is it possible that at Dumbarton there were two Browns with the same first name and surname in the same season? Were they the father and his son or maybe brothers? I am going mad!! How many Robert Browns were there in those years???" A I'm afraid that both Robert and Brown are just very common names. The Dumbarton players were not (to the best of my knowledge) related. The Robert Brown with two caps while with Dumbarton was known as 'The Sparrow' as he was a small but fast player and the Robert Brown with one cap was known as 'The Plumber' on account of his occupation. Both played in the Dumbarton sided that won the Scottish Cup in 1883. The use of the terms 'senior' and 'junior' can be misleading. While this can often refer to father and son, in this instance it merely denotes that 'Sparrow' Brown holds playing seniority over 'Plumber' Brown both for Dumbarton and for Scotland, having joined Dumbarton first and made his Scotland debut earlier. Regarding the Brown from Cambuslang, it's not that unusual for people in Scotland to be known by their second name. A good example is the former Rangers manager Scot Symon whose full name was James Scotland Symon but who was always known by the abbreviated version of his second name. Other international examples (and this is by no means an exhaustive list) are Robert CAMPBELL Forsyth, Charles RICHARD Gough, Richard ASA Hartford and Alexander IAIN Fordyce Munro. William Pullar Jardine was known throughout his career by his hair colour - SANDY - than by any of his forenames. Just as in more recent times there have been several players called Andy Gray and at least three bearing the name Gary Stevens it appears there were many named Robert Brown towards the end of the 19th century. In addition to the ones mentioned here there was a Kilmarnock full-back known as Robert 'Baker' Brown as well. To sum it up then these were three separate, unrelated (as far as is known) players. A One that comes to mind is when Celtic won the first of their nine in a row at Fir Park in 1965-66. They had to avoid a four-goal defeat to lift the title and won 1-0 with a late goal from Bobby Lennox, watched by an attendance of 21,234. A London-born Colin Jackson was a schoolboy signing who spent time with Aberdeen junior club Sunnybank Athletic before signing professional forms at Ibrox when he turned seventeen in October 1963. He went on to spend nearly nineteen years at Ibrox. Despite being reserve centre-half to Ronnie McKinnon for many years he still amassed a grand total of 518 first team appearances and scored 41 goals - an impressive total for a defender. He made his debut, aged nineteen, in a league match at Ibrox on January 2nd 1966 in a 4-0 victory over Partick Thistle in front of a crowd of 19,783 but didn't hold down a regular first team spot until 1970-71, the season in which he won his first medal as part of the triumphant League Cup-winning team. Jackson missed the Cup-Winners Cup Final in 1972 through injury and he really only came to regard a first team place as his own from 1974 onwards when he was an integral part of the fine Rangers team of this era. He won a League championship medal in 1974-75 when Rangers took the flag for the first time in eleven seasons and won all three domestic medals in both treble-winning seasons of 1975-76 and 1977-78. Perhaps his finest moment came in 1978-79 when he headed the winner in the League Cup Final against Aberdeen in injury time to the delight of the majority of the 52,871 supporters present. He picked up another Scottish Cup winner's medal the same season. He ended his Ibrox medal collection as he had started it when he appeared in the League Cup-winning team of 1981-82. His last appearance was on May 15th 1982 in the team beaten 4-0 by Aberdeen at Pittodrie in the League before a crowd of 16,058. In an inauspicious ending to an illustrious Rangers career he had the misfortune to open the scoring that day with an own goal. More than sixteen years after making his debut and seven months past his 35th birthday, Jackson was one of several celebrated Ibrox alumni (Sandy Jardine, Tommy McLean and Tam Forsyth were among the others) to be freed at the end of that season. Jackson wasn't finished with football though and played six times for Morton in 1982-83, including a 0-0 draw at Cappielow against Rangers. Later that season he dropped down into the First Division with Partick Thistle. He briefly rejoined relegated Morton in 1983-84, turning out twice in the League and once in the Scottish Cup. He was well into his 38th year when he made his final appearance in a 3-2 League defeat away to Clyde on March 17th 1984 in a match watched by just 763 spectators. His short spells with Morton and Thistle brought his career appearances to a total of 550 though he failed to add to his goals tally. He also played eight times for Scotland, coming to international football at the comparatively late age of 28 when he made his debut in a 1-1 draw in a friendly away to Sweden with 15,574 watching in the Ullevi Stadium in Gothenburg in April 1975. For those who think there is too much international football played these days it is salutary to note that his eight appearances came during a spell of 13 internationals in 13 months. His final international appearance was in the 2-1 ' through Clemence's legs' victory over England at Hampden in May 1976 watched by 85,167. They've got clips as far back as 1895 and you can view and download a free preview. A search for 'Ireland Scotland' produces 74 results including the football internationals from 1952-56 inclusive.